What is a wallet in the context of Bitcoin? What are wallets used for? What relation do wallets have to other concepts such as addresses, private-keys, client-software, and Bitcoin balances? Bitcoin is like digital cash. A bitcoin address is like an email account but for cash. A bitcoin address has a private key and a public key. The public key is like your email (joesmith@gmail.com) The private key is like your password to access your email (mypassword) The main difference here is that a bitcoin private key holds all the information to access the account. So with a private key you can get the public key. A bitcoin wallet holds the private keys to bitcoin addresses - so instead of a wallet, think of it as a key chain with keys to different safes. Wallets are used as an interface where you can access the bitcoins in your addresses without having to enter the private key in each time. It makes the user experience a lot easier. So instead of entering in your private key each time you just might enter in a pin code instead. Wallets also let you easily see the balance of each address, add and remove accounts (addresses) and send and receive bitcoin. This is a very basic explanation but a good one to start with. Hope this helps. Ownership of bitcoin is established through digital keys, bitcoin addresses, and digital signatures. The digital keys are not actually stored in the network, but are instead created and stored by users in a file, or simple database, called a wallet. The digital keys in a user’s wallet are completely independent of the bitcoin protocol and can be generated and managed by the user’s wallet software without reference to the blockchain or access to the Internet. Keys enable many of the interesting properties of bitcoin, including de-centralized trust and control, ownership attestation, and the cryptographic-proof security model. A graphical app for core tasks like: key (re)generation/import and performing blockchain transactions. 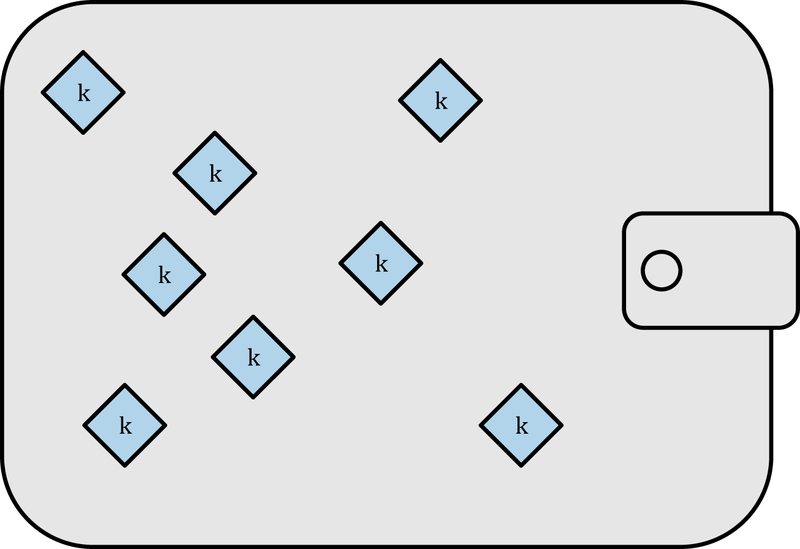 A database consisting of one or more keys and/or seeds. 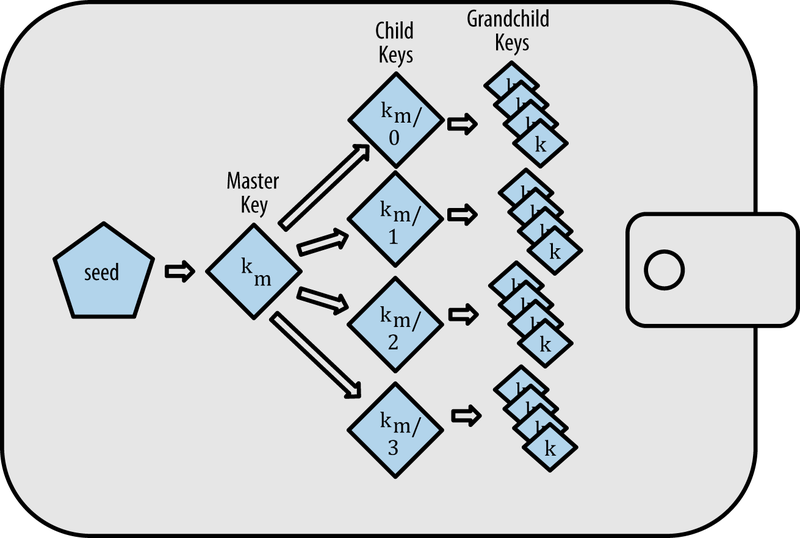 A seed or 'master key' can be used to (re)generate a set of keys. A set of keys is sometimes also called a keyring. Since the metaphor should emphasize "something used to protect and hold together the things of value" a single key could also be compared to a wallet, as it can hold multiple UTXOs together. The fact that paper wallet is a common term means that the software is often not considered to be an integral part of a 'wallet'. Yet in the digital contexts it is common to 'install a wallet' and generate a keyring, implying the opposite: that the keys are not integral to the wallet and they can be transferred between wallets. This apparent inconsistency is explained by the realization that the 'wallet' metaphor is very flexible and applicable to multiple scenarios of bitcoin management. In short, "wallet" is overloaded and can mean several things in the context of bitcoin. In Bitcoin terminology a wallet is a piece of software that allows you to manage your Bitcoin funds. Generally, wallets show information about your balance, track payments received/sent, and manage your private-keys, i.e. the secret information that proves your ownership of your bitcoins. Online wallets are accounts with companies that manage your Bitcoin balance for you, similarly to how banks manage money for you. This type of wallet gives you least control, but most customer support. Thin wallets store the ownership information on your device, but do not validate the status of the Bitcoin network themselves. They are a good choice as light weight clients for casual users. Full clients actually synchronize the whole Bitcoin blockchain and therefore the most secure. However, they require quite some time to synchronize with the network. The most important information of the wallet is stored in the wallet.dat for Bitcoin Core (and similarly so for other wallet types). This file should be backed up regularly to ensure continued ownership of your bitcoins. Also see: What is a good resource to help newbies choose their first wallet/s? Unfortunately, usage of the term "wallet" is sometimes not very accurate. It is common to see it used as a stand-in for "wallet-backup" or "wallet-data", e.g. in the context of wallet recovery and backups. Not the answer you're looking for? Browse other questions tagged wallet terminology or ask your own question. How do i find bitcoinadress? What is wallet? How is it uniquely identified? What is a good resource to help newbies choose their first wallet/s? What to save in a wallet? Can I create a deterministic wallet and export/disclose indiviual keys without compromising the wallet? What is the wallet in MultiBit?